There is only one way in which you will be able to check the status of your DV-2014 application and that is through the Entrant Status Check at www.dvlottery.state.gov and in order to check the status of your application, you will require your unique confirmation number. The Department of State will not be notifying individuals by letter or email of their selection for the Program. 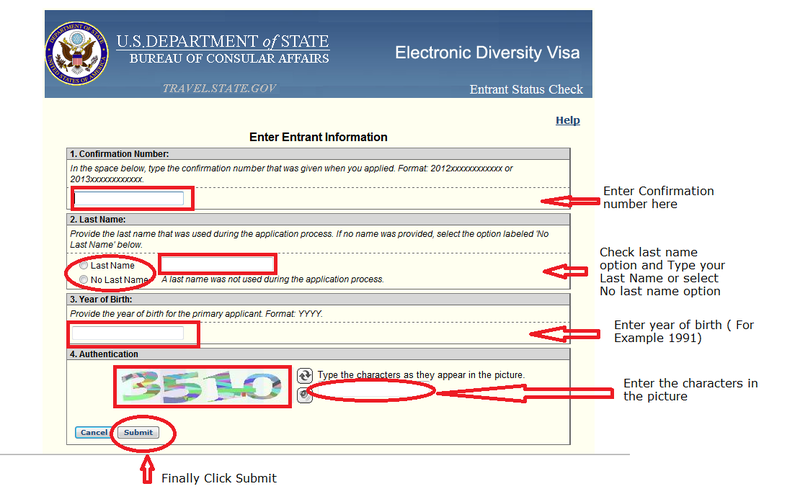 When registering on the official DV website www.dvlottery.state.gov, if your registration complies with the submission instructions for DV-2014, you will receive a confirmation screen containing your name and a unique confirmation number. Print this confirmation screen for your records using the print function of your web browser and retain this information in a safe place. You cannot check your DV entry status without your confirmation number and it cannot be retrieved later under any circumstances. If a third-party helps you to complete your entry form, you should be present when the entry is prepared so that you can retain the confirmation page and your unique confirmation number. Some facilitators may try to withhold confirmation numbers in order to make an unlawful demand for money or services in exchange for notification information that should have been directly available to you. Starting May 1, 2013 all DV-2014 entrants will be required to go to the DV website Entrant Status Check at www.dvlottery.state.gov to find out whether their entry has been selected in the DV program. You will be required to enter your unique confirmation number and personal information. Selectees will be directed to a confirmation page that will provide further instructions. 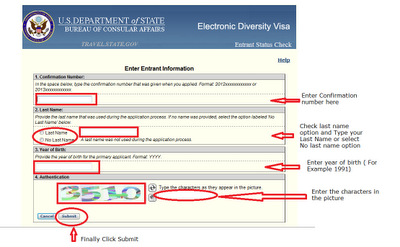 The Entrant Status Check will be available on the E-DV website at www.dvlottery.state.gov through at least June 30, 2014. All entrants should keep their confirmation number until June 30, 2014, whether they are initially selected or not. Remember! The Entrant Status Check will be the sole means of informing you of your selection for DV-2014, providing instructions to you on how to proceed with your application, and notifying you of your appointment for your immigrant visa interview. Therefore, it is essential you retain your confirmation number. · Errors in the DV application is not allowed once submitted. Labels: America Visa Lottery 2014, America Visa Lottery. DV Lottery Confirmation, DV Lottery Result, DV Lottery Result.